Join Facebook Events Directly via Desktop Messages? 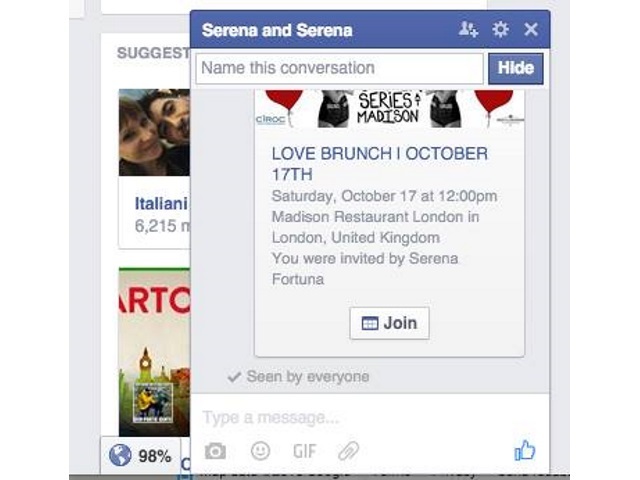 Some Facebook users are seeing the option to join events directly from messages on desktop. Reader Matteo Gamba of TransferWise shared the screenshots to the right and below, illustrating this feature. Facebook announced a host of upcoming changes to events in May, mentioning that they would be further integrated into its Messenger applications, but the social network did not mention desktop messages at the time. In recent weeks, Facebook users have been prompted to reply via Messenger when they decline event invitations, and the social network confirmed that it is working on adding the ability for event hosts to see when users have seen their events. Readers: Have you seen anything similar in your desktop messages?